If you’re looking for the best men’s hiking pants, you’ve come to the right place! Whether you need the best rain pants for hiking, a pair to wear while gardening at home or a comfortable pair to wear around the office, we found several great options to meet your needs and your budget! Before we get into the reviews, here are a few features you should be familiar with while shopping around for your next pair of men’s hiking pants. Material: Choosing the right material for your hiking pants depends on what you need from your pants. If you want some extra stretch, choose polyester or spandex pants. Nylon tends to be lightweight and water-resistant, and cotton is warm and durable. 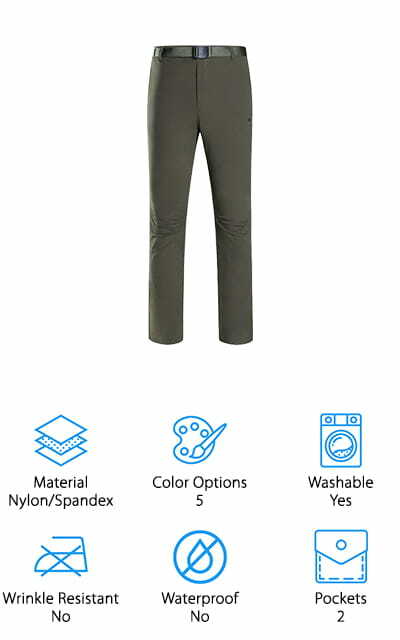 Color Options: We found hiking pants in a variety of colors to match your style! There are traditional khakis that look great on the trail. We also found some in darker colors that will look great while hiking or in the office! Machine Washable: In addition to the type of fabric, we also noted if the pants are machine washable. 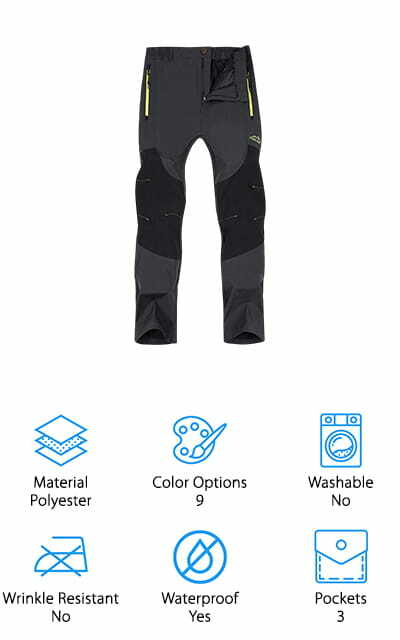 This ensures you can care for your pants to keep them in good, working condition, especially if they have waterproof or water resistant coatings. Wrinkle Resistant: If you want your hiking pants to double as office attire, a wrinkle resistant pair might be a good idea! They will look clean and professional at work, but you can also take them for a long hike after work! Waterproof: Taking your hiking pants on a boating or fishing trip? A solid pair of waterproof hiking pants will repel water and dry quickly, keeping you nice and dry while boating, fishing, or just trekking through some shallow creeks and rivers! Pockets: The number of pockets you need depends on how much you need to carry! We found pants with just a couple pockets for the essentials, or several pockets to carry tools, snacks, a small tackle box, or whatever you need! Now that you know what kind of pants you’ll need, let’s get into the men’s hiking pants reviews! 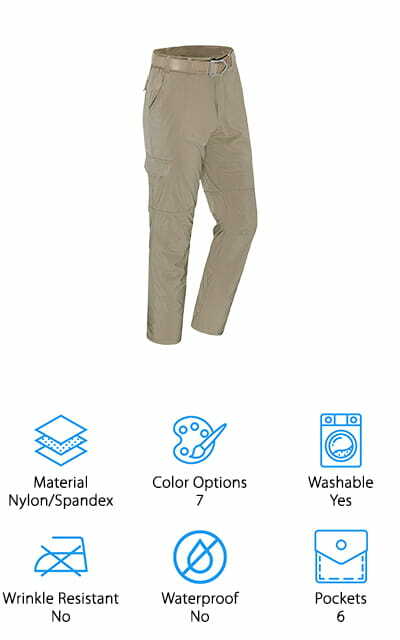 We researched 10 different pants that are great for a variety of outdoor activities, such as hiking, fishing, paintball, or just wearing around the office. They come in a variety of colors, price points, and styles to suit your personal style, too! If you’re short on time, start with our Top Pick and Budget Pick now, and read about the rest later! Our pick for the best men’s hiking pants goes to this pair of versatile and high quality pants from Eddie Bauer! We like these pants because they have everything you need in a pair of hiking pants. The fabric is sturdy nylon that’s water-resistant, lightweight to pack easily, and provides extra sun protection while you’re out enjoying a sunny day on the hiking trail, boat, or beach! We’re also big fans of the odor control waistband, so you can wash them less frequently and still stay fresh! There are 6 pockets, including 2 large zippered pockets on the side, to store plenty of tools or your large smartphone securely! We also like that these pants fit snug to the body, yet they provide enough stretch so you can freely move around. The tapered calves and ankles are slimming, and they come in 11 flattering colors! Grab a pair (or a few) for your next trip or for around the office! If you want the best cheap hiking pants to take on your next camping trip, or just wear around the yard, these pants have a lot to offer! 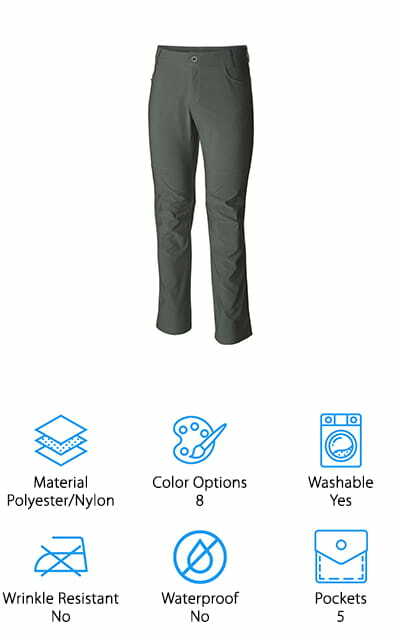 These polyester and cotton pants are wrinkle resistant, durable, and machine-washable, so you can trust they will last through several wears without wearing out! The elastic waistband and roomy fit make these comfortable and easy to move around in while you hike, climb, or run around! They have several options to store tools and equipment, including 8 pockets and 2 D-rings to hang things off the front belt loops! Another feature we really like is the extra pockets on the knees, which allow you to add knee pads! That way, you can work, garden, or climb without discomfort! 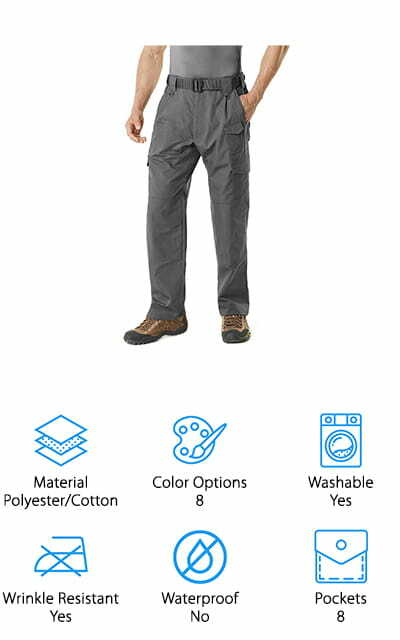 We think these are great men’s hiking pants to take with you to your next job site, your next outdoor adventure, or to work on that to-do list around the house without breaking your budget! When looking for the best pants for hiking, we also wanted to make sure we found a few options for convertible hiking pants – and these from White Sierra are one of our favorites! These pants quickly go from pants to shorts by just unzipping the knees to give you more breathing room! The lightweight nylon is easy to pack in your bag without adding weight – especially if you have to add/remove the legs as you go. They’re also machine-washable, making it easy to get them nice and clean for your next day of hiking. We also like that you can adjust the ankle openings to loosen or tighten for added comfort or protection from bugs, dirt, and weeds. The 7 pockets are large enough to fit whatever you need, including tools, your phone, and some extra snacks for long hikes. If you want versatile hiking pants that convert to shorts in a snap, consider picking up a pair of these! 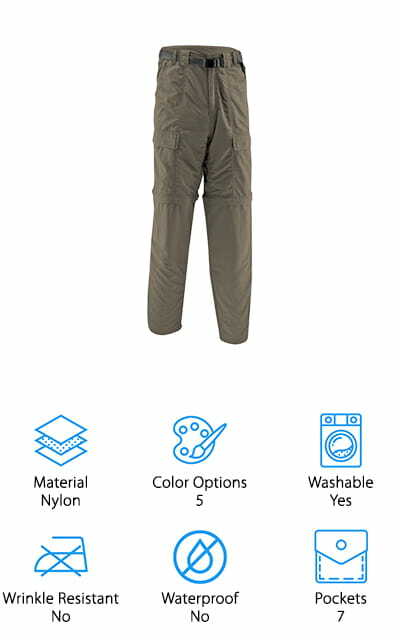 If you want a pair of hiking pants to take with you on your next fishing trip, consider grabbing a pair of these waterproof hiking pants from Singbring! The polyester fabric repels water quickly, allowing you to stay dry and warm while you’re out on your boat, walking through the snow, or wading through shallow waters. These are thicker pants, which make them great for cooler weather sports like skiing, fishing, high-elevation hiking, and more. There are 3 zippered pockets to keep small items at hand like a compass, gloves, or your phone. The fit on these pants is slim, so they stay close to your body and prevent snags while hiking in thick vegetation. For some added comfort and a custom fit, we like that the waistband is elastic and adjustable. This is great, especially since these are marketed to fit great on both men and women! Grab a pair of these before your next fishing or boating trip! Would you rather avoid synthetic fabrics when out hiking, climbing, or working hard? This pair of military cargo pants from OCHENTA is made of 100% cotton, and they’re incredibly durable! The fit of these is loose and comfortable, but they do tend to fit on the small side, so go up a size if you want them a little roomy. Since they’re made of 100% cotton, also remember that washing in hot water or drying will shrink them, so you may want to size up anyway! We like these pants a lot because they are sturdy and have tons of space to store tools, paintball ammo, or whatever else you want in the 8 roomy pockets. We also like that you can tighten the ankle openings to protect your legs from dust, bugs, and other debris. These are good hiking pants for doing just about anything, from doing yard work to climbing mountains, to just hanging out with your friends! If you need ultralight hiking pants to pack in your hiking backpack that also need to be waterproof, these pants from TBMPOY are the best of both worlds! These pants come in two thickness options: a thinner pant for warm-weather activities like sports or boating, and a thicker pant for cold-weather fun like skiing or ice fishing. Both options are super lightweight, so you can pack them in your knapsack or luggage without adding much extra weight or bulk! The lining is a stretchy, cozy fleece that makes the pants durable and wind-resistant, too! We like that the outer fabric is not only waterproof but also rip-stop to prevent large snags and tears. They come in 8 neutral color options, which is great because you can find a pair to fit your current outdoor gear perfectly! If you need waterproof pants that won’t weigh you down, these are a great option to toss in your bag as a backup pair! Next up is another great pair of lightweight hiking pants from Columbia, one of the most popular outdoor clothing brands around! These hiking pants have a slightly fitted, yet casual look that will take you from hiking in the woods to weeding your garden in style. They have 5 pockets, including a knife pocket for camping or gardening tools. We like that they have articulated knees and a little stretch for added comfort. These are great for wearing in the spring and summer months because they are made to handle warm, sunny days! They are made of Omni-Wick fabric that pulls away sweat on those balmy summer days. We also like that the fabric provides UPF 50 sun protection, so you can feel good wearing these thin, lightweight pants without worrying about a sunburn! They even come in 8 colors, so you can buy a few to match different outfits! We think these great for serious hikes or casual Sundays! If you’re looking for comfort, these convertible hiking pants from Jessie Kidden are a great choice! 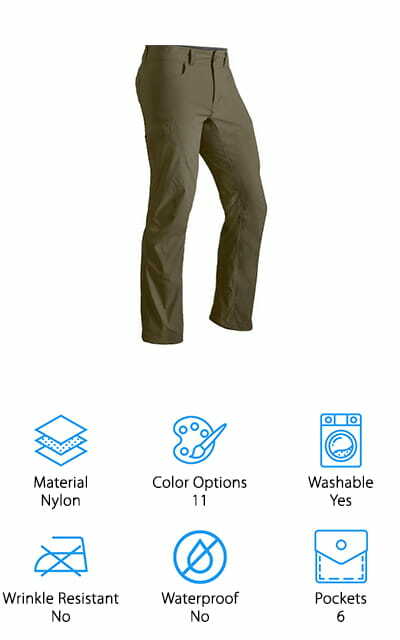 The looser fit of these pants is super comfortable, and the stretchy fabric means you can easily stretch and bend while hiking, fishing, mountain climbing, and more! They also have 6 large pockets to store everything you need on your next hike or a day at the farmer’s market! Our favorite thing about these pants? They easily convert to shorts when you want to let your legs breathe! The pant bottoms easily unzip to create shorts, and the zipper is hidden under the short seam, so it’s not noticeable that these are convertible pants! The water-repellent fabric dries quickly and provides extra UPF sun protection, making these great for taking on your next summer adventure. We also like that these are machine washable, which is super convenient! We think these would make a birthday or Father’s Day gift for the outdoorsman in your life! Looking for the best hiking pants that could pass as work slacks and are also incredibly flattering? Grab these hiking pants from Camel, and take them on your next hike or your next board meeting! These nylon and spandex hiking pants are cut to flatter your figure, no matter how thick or thin your legs are! The extra stretch from the spandex and the elastic waistband also help flatter your shape by allowing you to move freely and confidently. They also come in 5 dark colors that are both office-friendly and visually appealing to the eye. We like that the fabric is durable, flexible, and water-resistant to get you through a rainy hike or a coffee spill at work! The breathable fabric also helps wick away sweat and potential odors throughout the day! We think these are great to wear while playing a little touch football, and they look amazing paired with a nice button-down shirt at the office, too! Last up in our hiking pants buying guide are these comfortable and lightweight pants from Unitop. We think these are great pants to take with you on your next summer camping trip, hiking excursion, or just wear around the yard! The fabric is water-resistant and dries quickly, so you can take them canoeing or fishing without worrying about sitting in sloppy, wet pants all day long! These are also incredibly lightweight, which makes them perfect for rolling up and tossing into your camping knapsack without weighing you down. They also have 6 large pockets that hold plenty of snacks, supplies, or tools to get you through your next outdoor adventure. We also like that they come in 7 different colors, so you can find a pair – or a few – to match your style! For a solid pair of men’s hiking pants that won’t weigh you down, we think these are a great option to take with you wherever you go!